To meet the variety of information needs for individual projects, NPPD’s research staff gathers and organizes the hard-to-find, local information required to evaluate individual community sites. Additionally, the research team monitors the economic conditions for target industry clusters in NPPD’s service area. NPPD’s research team also provides customer communities with local demographic, economic, and labor force data assembled in easy to use, electronic and print formats. 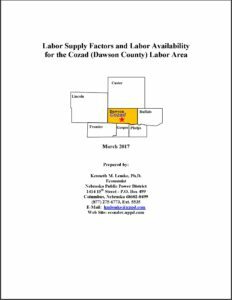 Labor studies provide information along with recent population, labor force, occupation, industry, and wage data for a community’s laborshed. Labor studies typically provide an overall view of the laborshed’s workforce and labor force but can also be customized to focus on the needs of specific industries. Nebraska Public Power District’s (NPPD) series of industry opportunity studies analyze and quantify the industrial location advantages of NPPD’s service area and communities for specific targeted industry groups. The studies compare the geographically-variable operating costs for NPPD’s service area with the geographic areas where these industries have traditionally been concentrated. In each study a model plant that is representative of the respective industry group is “constructed” and used to quantify these geographically-variable costs. The comparative advantages of NPPD’s service area are then quantified by the two principal cost dimensions (labor-related and energy costs) that vary geographically. Nebraska offers a wide range of locational advantages to manufacturers. An attractive business climate, a well-educated and productive labor force, reliable supplies of low cost energy, and a location central to national markets are among the leading advantages of a Nebraska location. Read on to learn more about what each study offers. Economic and demographic trend studies provide data on labor force, employment, wages, population, migration, residence and work flow patterns, retail sales, and income for a city and county and comparable data for surrounding counties. Trend Studies have been completed for a number of Nebraska counties. 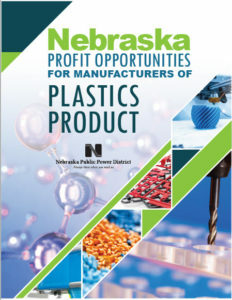 If you are interested in obtaining any of these research reports please contact NPPD’s Economic Development Department by calling (402) 563-5534, or by emailing econdev@nppd.com.